I have Made lots of cakes but this one is my most favorite and today I am sharing it with all of you, my super duper hit recipe of black forest cake. I would say if you want a soft sponge cake than do try it. Some of my friends tried it and all of them like it a lot hope all of you will also love it. Moreover this cake is without oil and butter. Sift together all purpose flour, baking powder and coco powder. Set aside. In a mixing bowl beat eggs and sugar together until mixture comes fluffy and creamy in texture and double in amount, it will take 10 to 12 minutes with electric mixer. Add vanilla essence and mix it for few seconds then slowly put in 1 tbsp dry ingredients at a time and allow it to mix, continue adding the dry ingredients one tbsp at a time and mix it well. Pour mixture in the greased pan so the cake mix settle evenly in the pan. Set pan in the oven and bring oven temperature down to 190C and bake it for 25 to 30 minutes or the tooth pick comes out clean. Bake it in water bath, let it cool completely and then frost the cake. First put your bowl and whisk in the freezer for 20 to 30 minutes before you start whipping the cream. Cream should be chilled in the fridge not in the freezer, it will help to whip the cream soon. Now start beating the cream when it starts thicken then add sugar and beat it until soft peaks and then add vanilla essence after that be careful don't whisk it for long time just beat it until it start becoming stiff peaks and stop the beater and mix it for 2 to 3 time with hand whisk, it will prevent to curdle your cream. If unfortunately it happens than add little bit more cream and beat it for few seconds and decorate cake and enjoy super duper delicious soft and spongy cake. Halved the cake, spread layer of cream eventually on one halve of cake then spread pineapple chunks. Cover it with other cake halve and cover the cake with whipped cream neatly. 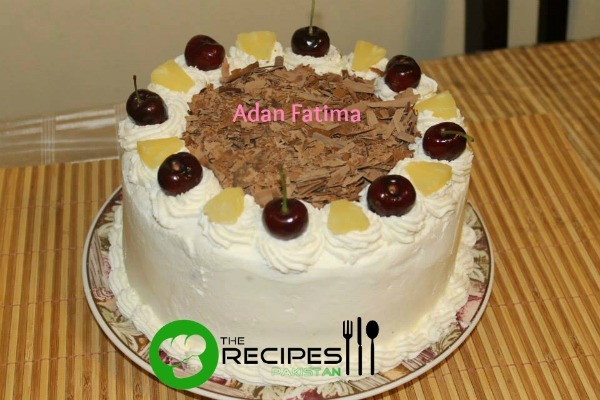 Decor with cherry, pineapple chunks and chocolate shaving. Let cool it then serve.